September in Michigan always gives me crazy mixed emotions. 80% of my soul wants to put on a cozy sweater, cook a million pumpkin-filled things and guzzle apple cider like there’s no tomorrow. The other 20% is like “wait, it’s 80 degrees today, the humidity is out of control, and I almost sweat to death trying to sleep with the windows open (and #oneflops pressed against me) last night.” Whomp whomp whomp. Back to life . . . back to reality. Cold salads rather than hot soups are still the name of the game for at least another few weeks. 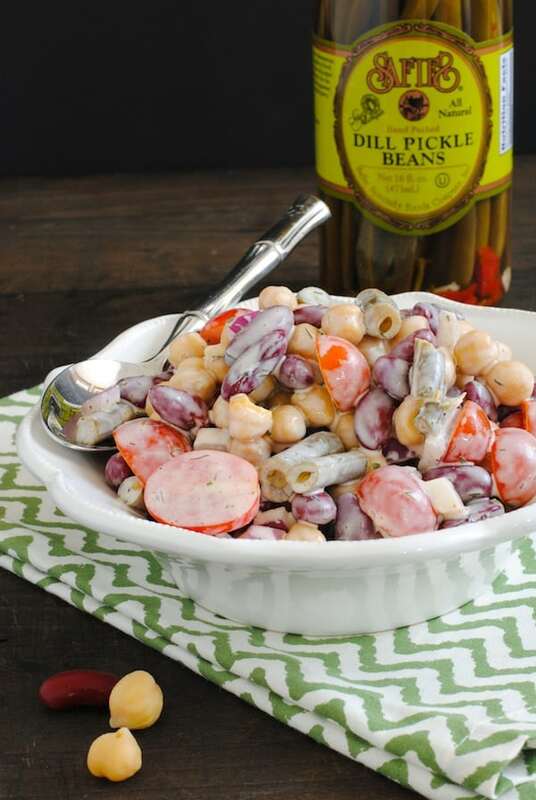 While the dill pickle beans would make a perfect garnish to a bloody mary, I’ve used them here as a tangy component to a three bean salad. 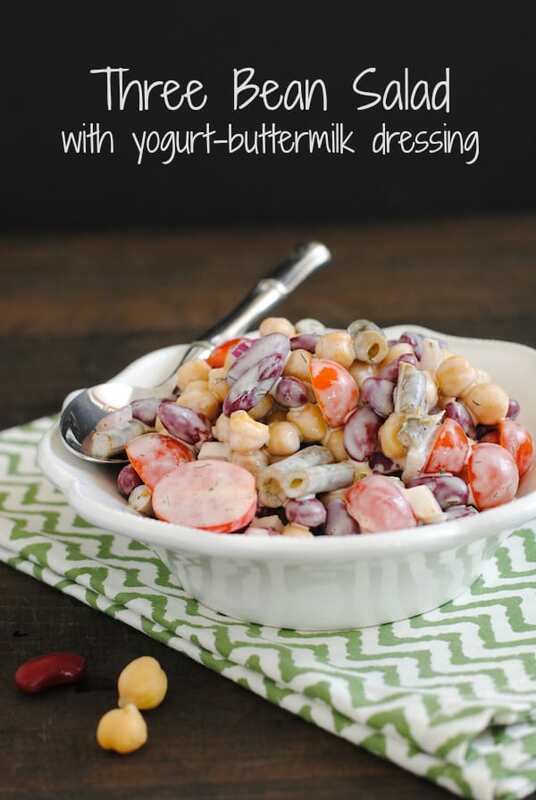 Kidney beans and chickpeas add a nice punch of protein, and grape tomatoes and onions keep things interesting. Everything is tossed with a light yogurt-buttermilk dressing made with lots of herbs and spices. 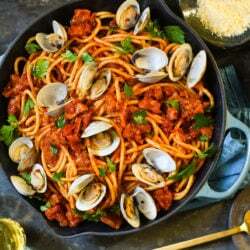 I made this, packed it into a storage container, and fully planned on eating it with my lunches for a week straight, thinking Jeff wouldn’t be into it at all. Turns out, he LOVED it. So against all odds, this little salad is a husband pleaser. Go figure. 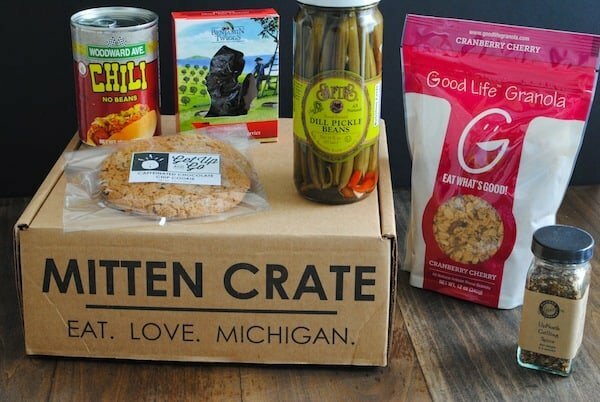 Want to try a Mitten Crate of your own? Click HERE to get started, and use the code FOXES5OFF for $5 off your first month’s subscription, or use the code FOXFREESHIP for free shipping on a one-time order. 1. 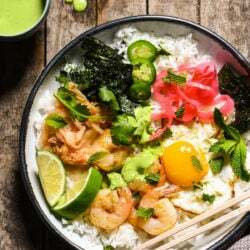 Make the Yogurt-Buttermilk Dressing: In small bowl, whisk together yogurt, mayonnaise, buttermilk, parsley, dill, garlic powder, salt, pepper and paprika. 2. 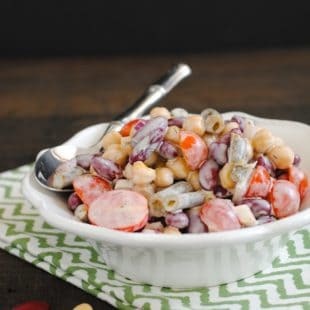 Make the Three Bean Salad: In large bowl, toss chickpeas, kidney beans, tomatoes, pickled green beans, onion and Yogurt-Buttermilk Dressing until well combined. 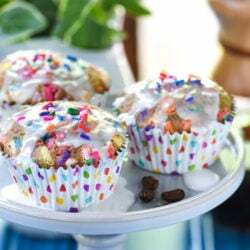 For best flavor, refrigerate at least 2 hours or up to 2 days before serving. This post was written by me on behalf of Mitten Crate, who provided me with a free box for recipe development purposes. I was not otherwise compensated for writing this post, and all opinions are 100% my own. I did love this salad . . . It was the perfect accompaniment to a homemade sandwich for lunch. I think this would be a good cold side dish for any fall themed picnic or tailgate. For sure.